This Nickelodeon Sock Advent Calendar Is Only $20 - What Are You Waiting For, Football Head? Psssst . . . Target isn't the only retailer selling affordable 12 Days of Socks Advent calendars this year. Kohl's is also stocked up with festive sock-filled calendars aplenty, including one that's Nickelodeon-themed! 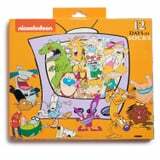 This nostalgia-packed Advent calendar features a dozen pairs of low- and crew-cut socks covered in familiar faces - like SpongeBob SquarePants, CatDog, Helga Pataki, Otto Rocket, and more. I don't know about you, but just looking at this Advent calendar has me reminiscing about Saturday mornings spent watching the Rocket Power kids cruise through the streets of Ocean Shores on their skateboards. *Sigh* If only time travel were a thing. For now, I suppose I'll just have to settle for slamming that "Add to Cart" button on this Nickelodeon-themed set of socks.